South Africans are saving thousands and reducing waste by turning objects that otherwise would have ended up in the bin into furniture, decorations or even gifts. Some try "freecycling" – bartering items they no longer need. Others prefer to "upcycle", giving new life to objects destined for the trash. Fin24 previously reported on the value of waste pickers to the South African economy. Companies like Upcycle, meanwhile, turn donated "junk" into everything from training manuals to corporate gifts. Then there is freecycle.co.za, which offers Cape Town residents a platform to network and swap unwanted items. 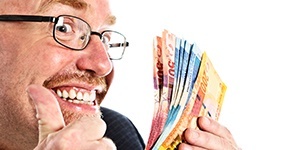 No money may exchange hands, and there may be no advertising of business interests. But individual hobbyists also find reducing waste is kind to both the environment and their pocket. 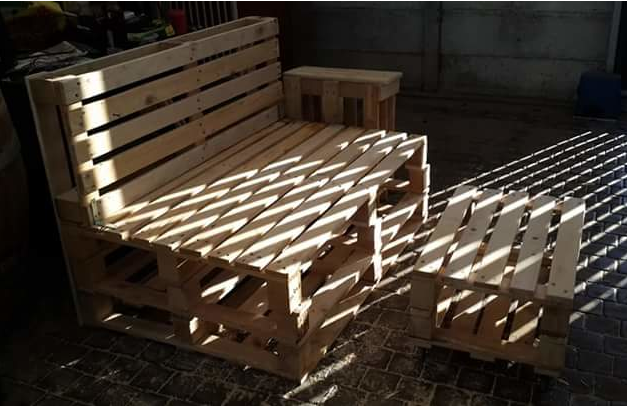 Shayl Voss, a Cape Town data specialist, says she has saved thousands making her own furniture out of "cheap and sometimes free items that anyone can get hold of and make with minimal tools". Some of the items she is most proud of are a pallet headboard, a couch and a side table she made from a tree stump. "A hammer, a saw and some nails will do," she told Fin24. "A sander is preferred if your wood is very rough, but you can sand by hand if you don't have the equipment – or borrow from a friend." For the finish, "any old paint" works, she says. Acrylic white wash is inexpensive and popular, or try normal paint, wood oil, varnish or "the latest craze – the burnt wood effect", achieved with a blow torch. Voss made a headboard out of pallets, nails and wood glue. She also made couches and tables by stacking pallets on top of each other and gluing them together. "Generally it would cost around R500 – R600 to buy a table like this. You can easily make one for under R100," she says. The couches can be used indoors or outdoors, with pillows that can also be upcycled. New outdoor couches easily retail for R4 000 or even R12 000. Pallets cost around R30 each. Voss says tables made of tree stumps are her favourite "as you see the most transformation". But, she says, these require "time and elbow grease". She has picked up tree stumps at the roadside. Just ensure they are not infested with insects that can invade your home, she advises. Using a hammer and chisel, she removes bark and defects. Then she levels out the stump using a saw and chisel, sands the stump, and treats it with linseed oil. "A side table like this would usually cost around R1 000 in a shop, but making it at home will be between R100 – R200 depending on the sandpaper required and your final finish," she says. Peter Sutherland works in a book store by day. After hours, he is a treasure hunter. If you believe one man's trash is another man's treasure, that is. "If I see a screw lying in the road I pick it up. Partly because I don't want to drive over it, but also because I might need it at some point," he says. Sutherland has saved thousands through upcycling, including picking up a working Queen Anne fireplace near a storage unit, where it had been abandoned at the bins. It only had one leg missing. He found a matching fireplace at a junk shop – and there was a spare leg. "My wife talked them into selling us just the leg," he says. A similar fireplace costs anything from R3 000 to R8 000 on Gumtree. Like Voss, he doesn't fork out thousands for furniture. Instead, he gets scrap wood from a nearby dump. "There's always wood being thrown away. You can pay 10, 20 bucks and there's perfectly usable lumber thrown away from building sites – it's just too short for whatever is being built." Sutherland built rainwater tanks out of old dirtbins, and planters from scrap wood and old flower pots a neighbour had thrown out. 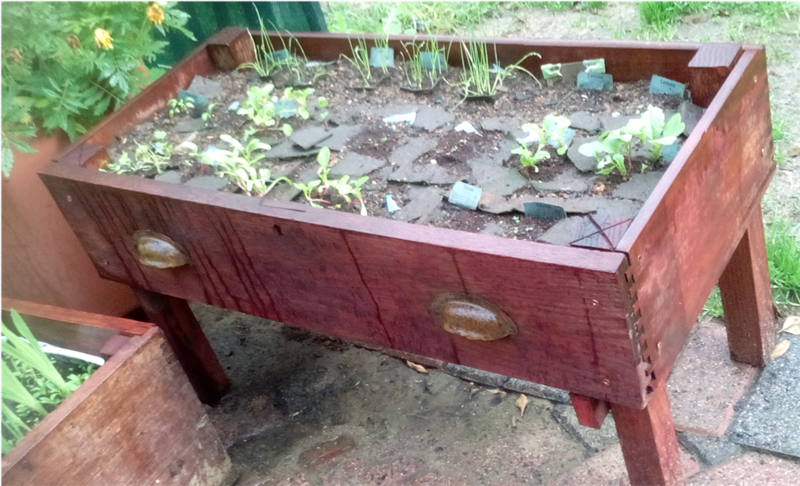 He turned an old drawer into a rustic seedling tray. He also refashioned discarded antique chairs. 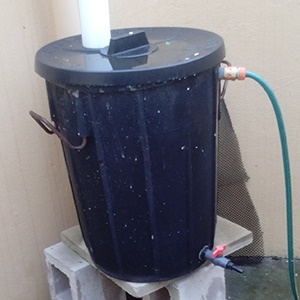 Similar size rainwater tanks cost at least R250, while similar planting systems can cost anything from R600 to several thousand rand. Similar chairs, once fixed, retail for upwards of R1 000 each. But perhaps his favourite project was his water-saving toilet cistern, made out of scrap wood and Christmas baubles. It both saves water and alerts the user, by the bauble position, what the water level is. Both he and Voss say they can't say what upcycling has saved them in total, but eliminating waste is a way of life. "Once you get into the hang of upcycling and reusing items you start to see everything in a whole new light," says Voss. "You are a lot less inclined to throw anything away, no matter how broken, in the hopes of somehow transforming it into some new and useful again." - It's National Savings Month. Do you have a successful savings plan or story to tell? Share it with us nowand help others to also become Savings Heroes. For more on savings, visit our special Savings Issue. Generally it would cost around R500 – R600 to buy a table like this. You can easily make one for under R100. If you are unable to save, perhaps it’s time to look at the relationship you have with money, says Eunice Sibiya, head of consumer education at FNB. 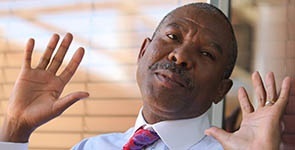 From paying your children's school fees in advance to prioritising settling your debt, Kganyago and four other top financial brains share their most successful savings habits for National Savings Month.